Got this in a quick draw this morning, and what a lovely take on the 10 of cups in is. 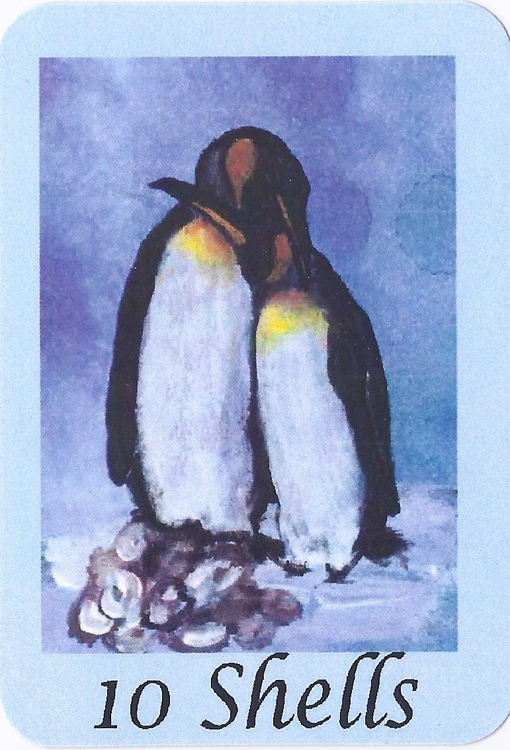 We have the two penguins leaning on each other, comfortable together, supporting each other. At their feet they have a whole pile of shells, material prosperity - not in excess, but just enough to ensure their comfort, happiness. A reminder, I think, to keep things in perspective. As my time in Tunisia starts to draw to a close I find myself more and more stressed out by all the things I have to do when I get back, and about how much more I could have/should have gotten done while here, and all the like. Perspective - all those things are doable, none likely to really lead to disaster, and remember all the good I have, have had - remember to appreciate. A constant exercise that, positivity, appreciation even as you strive, keep working on things. Also a reminder about my outlook on returning...mostly I have been dreading it, and all the things I have to do but, on the other hand...it will be a chance to re-connect with my friends and family, at least for a bit, and that can be quite nice in and of itself. Yesterday I had the 3 of Stones, or coins, show up. Must say, love the naturalism and the watercolor work on these cards. Anyway, yeah. Three stones for three birds. Each one can focus on it, become a specialist, yes? Or is it one bird with three stones and the others just to look on, learn? Is it better to be specialist, to focus on one thing at a time and really do the most with it, or to broaden your focus even at the cost of depth? There are so many things I need to, and want to, do, learn, see, engage with. It's hard for me to stay focused on any one thing for an extended length of time. And yet, without focus...how can I really get what I want out of any given things. Sometimes I try to do it all and get frustrated. Is it better to let something go, and if so what, and when, and in what way? Questions and decisions. What to nurture, then? 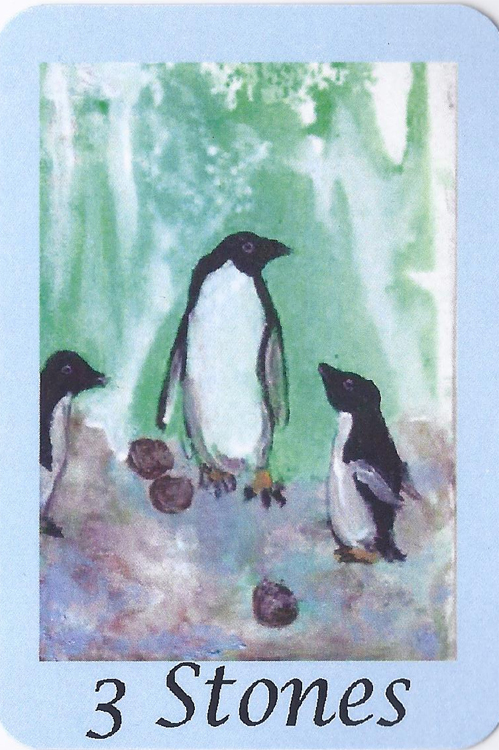 Those Penguin cards are gorgeous!